Grind ginger, garlic, kashmiri chilli powder, turmeric powder,pepper powder, cinnamon, cloves, cardamom and cumin seeds to a smooth paste. Heat oil in a pan, add chopped onions and saute till light brown. Add ground masala and salt and fry well until oil starts to separate. Then add 2 tbsp butter and tomato puree and mix well. Add 2 tbsp butter, cashew paste and coriander leaves and simmer for 1 or 2 minutes. Serve hot with chapati / naan etc.. I loved the way you presented it..Clean and yummy. 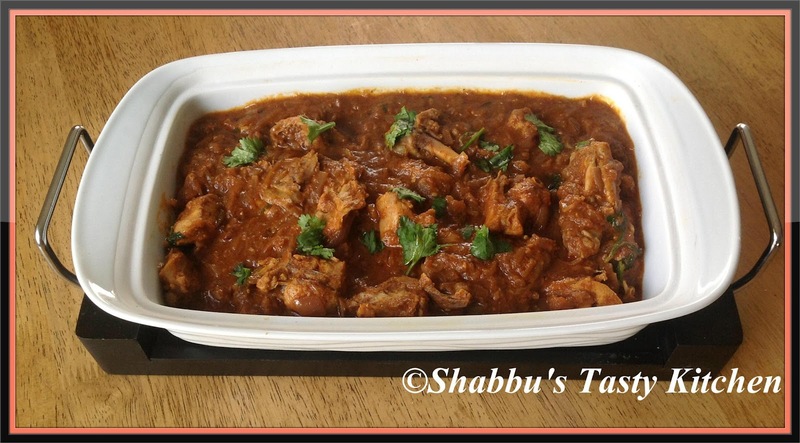 Love ur serving bowl,super tempting chicken butter masala.wish to have with some rotis for my dinner tonite. Super tempting chicken butter masala curry. How wonderful, thanks so much, I even have everything to make your masala and can't wait to try. Butter Chicken is one of our favorite dishes...looks wonderful!